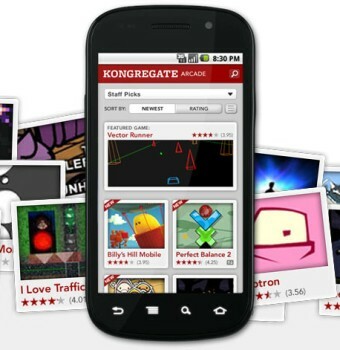 Just hours after it launched, Google removed the Kongregate Arcade app from the Android Market for violating rules against apps that distribute other apps. Released yesterday, the Kongregate Arcade app offers direct access to more than 300 free Flash games on the GameStop-owned Kongregate service. It went over well with gamers, being downloaded "tens of thousands of times," according to a statement from GameStop, and notching up a rating of 4.5 out of 5 stars. Yet without warning or explanation, Google pulled the app from the Android Market very shortly after it launched. According to a statement later released to Joystiq, Google put the kibosh on the app because it violated the Android Market Developer Distribution Agreement, specifically a rule against apps that distribute other apps. Details are a bit short but the complaint would appear to relate to the fact that the Kongregate Arcade allows Flash files to be downloaded for offline play. Kongregate said on Twitter that it's working with Google to get the app back on the Market, but in the meantime gamers who missed it the first time around can still snag the app directly from Kongregate at kongregate.com/android.